Last month I participated at June Card Chain Challenge over Deborah’s blog. It is a fun card swap challenge. You created a handmade card and send to the person above you on the sign up list and then you will receive a handmade card from the person below you on the list. So, you send out one, you’ll receive one. Beside it is fun and challenging, it is also where you can make new friend and networking between handmade card makers. They are amazing! To know how you can participate in this month challenge, visit Deborah’s blog here. 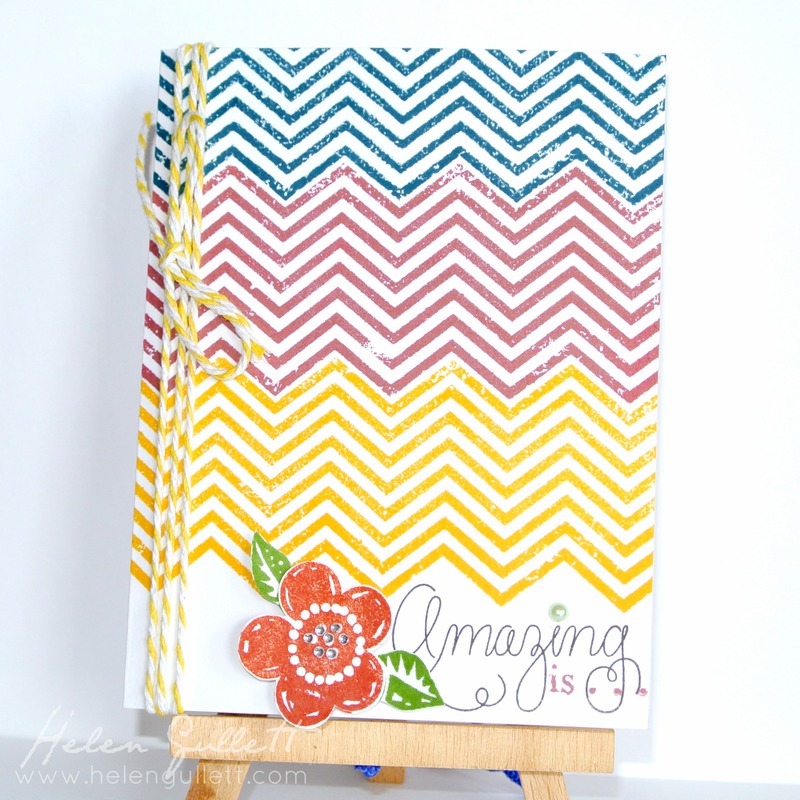 I love this chevron stamp from In The Background (D1540) that can be used to create fun and colorful background. To create this background card, I stamped it using Outdoor Denim (Z2140), Ruby (Z2170) and Honey (Z2162) Exclusive Inks Stamp Pads. Then I stamped the sentiment from Love This (B1432) with Black Exclusive Inks Stamp Pad (Z2105). The inside phrase is from March 2013 SOTM (S1303) and I stamped it with Ruby Exclusive Inks Stamp Pad (Z2170). And finally, I wrapped yellow and white baker’s twine that I got from Pick Your Plum website. I LOVE your card Helen! 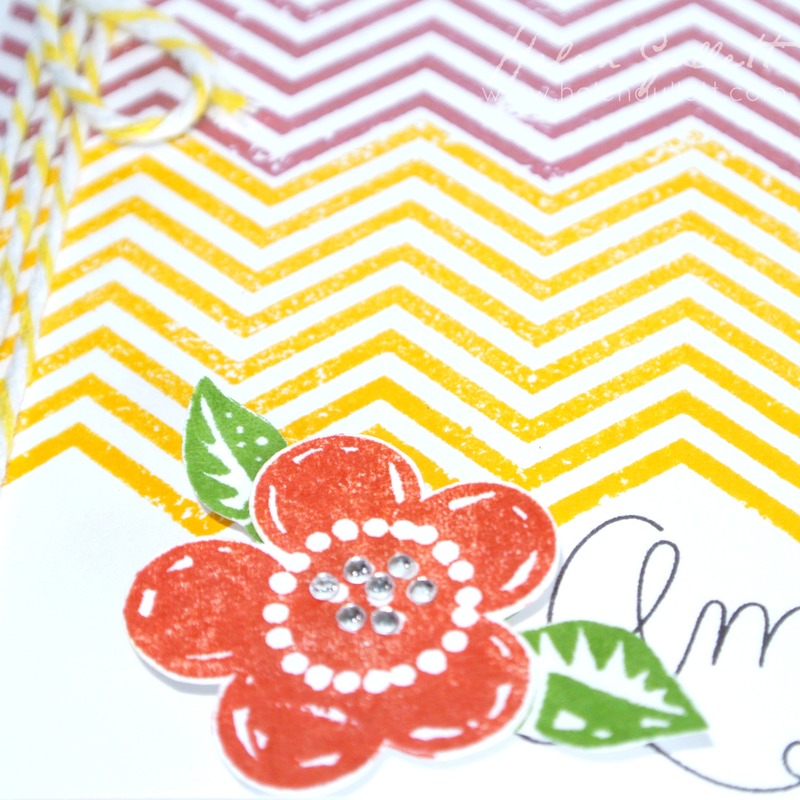 The colors are wonderful and so is your stamping! Thanks for sharing the card chain, such a neat idea! Thanks Amy, I hope you can join the fun!